Blipfoto: the rise and fall? Interesting news from Polaroid Blipfoto Chair, Ian Ritchie in The Scotsman. 'He said yesterday [17th March] market research had suggested that the strength of the Polaroid brand would ensure a leap in subscriber numbers, but it did not happen. 'At the start of this year, Blipfoto rebranded after forming a partnership with Polaroid. No money changed hands as part of the deal. The article does not say if there was a non-monetary exchange, for example, shares for a license to use the Polaroid brand. Given that Polaroid gained 85,000 convertible redeemable preference shares according to the Companycheck data below it might be expected that something was received in exchange. I wonder what those shares are worth now? (see Scottish Enterprise Annual and Report and Accounts for Year Ending 31 March 2014). In the SE 2013 Accounts these figures were respectively 27.01% and £325,000. From this it seems that an increase in shares from £325,000 to £430,00 (£105,00) secured an increase in absolute voting rights of 2.42%. In the 2013 accounts a 1% share of voting rights was acquired for £12,032. In the 2014 accounts this figure had risen to £14,611. This may be accounted for by revaluations, provisions and inflation. The article also states that, 'Blipfoto boasted more than five million days of human history on its pages and attracted 18 million visitors every month' but it does not say if these were unique visitors or repeat visitors. The Hilco Global press release of 18th March notes 2.4 million unique visitors a year. There has also been a pretty consistent groundswell of opinion from Blipfoto users today on Facebook and replies to posts on Blipfoto that information about the link up with Polaroid was not always forthcoming and users felt left in the dark. 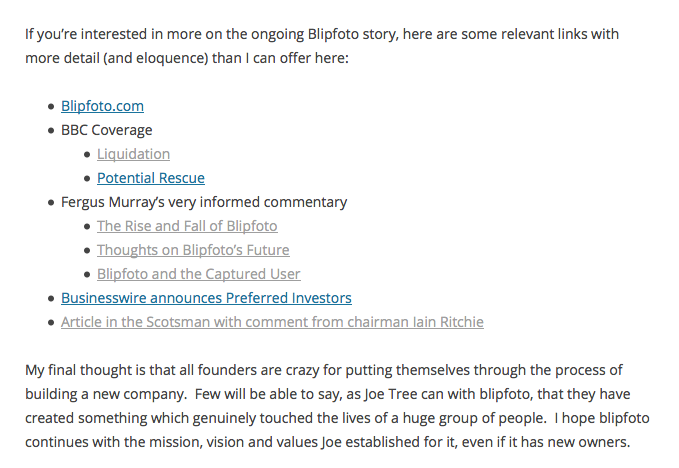 These slightly disjointed notes give my view of the growing gap between the company Blipfoto and its user community. As a relative newcomer I may be wrong about that but looking back through the press reports about Blipfoto I was surprised how much private money has gone into the company. Please comment and correct me either here or on my Blipfoto page. I will leave comments up unless abusive but that doesn't mean I necessarily endorse them. 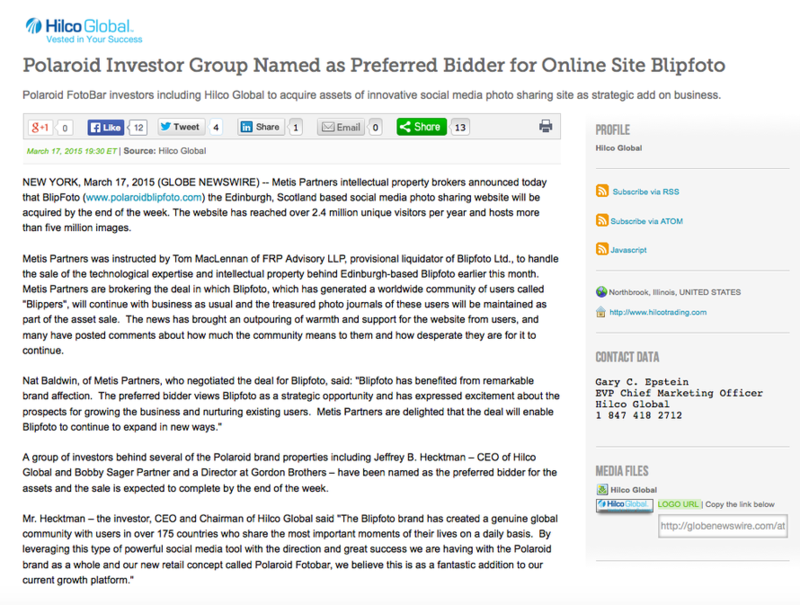 From 2012 it seems that Blipfoto Ltd was really trying to go places with £700,000 of new investment, important board appointments and the appointment of an advertising company. It could be that the tie-up with Polaroid came as part of this process of global expansion. "I look forward to helping them grow this business into a recognised global player and to providing a great service to photographers everywhere." “Blipfoto is ­already operating like a $200 million company with Ian [Ritchie] as chairman. With Gareth [Williams] advising them on social media ­retail, they’re going to start acting like a $500m company” (see The Drum here). The industry magazine, The Drum covered some of the key events at Blipfoto. This link goes to articles in The Drum with a Blipfoto tag - although it doesn't cover the Polaroid tie up - you need to use the Polaroid tag to find this. For Blipfoto Directors and Company Secretary see this link at Companycheck. 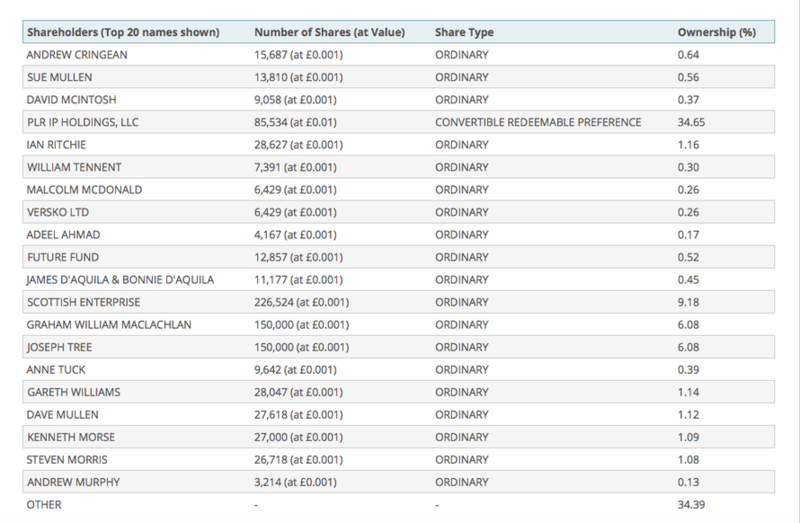 Companycheck list of the top 20 Blipfoto shareholders (downloaded 16.03.2015). Click for link to Companycheck page. Without more detailed financial and user/demographic data it's hard to get a sense of the company's growth path. But it seems there were some investors who thought it was going to go 'massive' - at least in terms of a local Edinburgh social media start-up. The company had impressed the industry, had won media awards and was backed by Scottish Enterprise which held 9.18 per cent of its shares. But I'm left wondering how the company was planning to generate the revenue or share price growth to satisfy its investors. Was this to be done through membership fees of £25 a year or the lifetime membership offered of £85? Were there plans to bring in advertising or somehow to monetise the user data and/or content that was being generated? Or perhaps there was a hope that the company would catch the social media third wave and be sold off for a mint to a larger concern? For a community that has become so important to its members it salutary that we don't know the answers to these questions. In January 2015 the tie up and rebranding of Blipfoto with Polaroid as Polaroid Blipfoto was announced. According to the Companycheck shareholder data above PLR IP Holdings, the parent company of the Polaroid Corporation held 34.65% of the company's shares as convertible redeemable preference shares. In effect this was a risk limited investment in the company as these shares are a fixed income security that guarantees a defined return to the investor. If the investor so wishes these can also be converted to Ordinary shares at a later date. The 2014 Annual Return - filed in July 2014 at Companies House, for Blipfoto Ltd says, to my surprise, that the 85,534 convertible redeemable preference shares owned by the Polaroid holding company, PLR IP Holdings have 'full voting rights' and that the amount 'paid per share' was £2.74 and they entitle the holder 'in respect of capital to a full participation in a distribution (including winding up)'. From the Blipfoto Ltd Annual Return filed at 10.07.2014 at Companies House in the UK. The PLR IP Holdings shares might have had a paid per share value of £234,363 but this is only a face value and were presumably exchanged for licensing and branding rights from Polaroid. An update. As I suspected the public record can be incomplete and misleading with these things. So 'full voting rights' needs to be qualified by what is stated in the company's Articles of Association - for example different classes of share have different percentage rights in terms of voting - and this can be further qualified in a Shareholders Agreement drawn up between a company's shareholders. Further, voting rights to shares can only be exercised at AGM and EGMs. The decision to liquidate was apparently not done through an AGM or EGM - as Joe Tree said it was the decision of the Board of Directors. PLR IP Holdings did not have a director so did not have a formal say in the decision to liquidate. The article suggests that Edinburgh's angel investors bring good business and mentoring experience to their favoured startups and that they may be more patient for a return than mainstream venture capital funds. It is may not too far a stretch to say that the tie-up with Polaroid through the parent PLR IP Holdings represented a radical departure for Blipfoto in terms of its financing and control (although CRP shares rarely have voting rights). If my reading of the working of CRP shares is right Polaroid's investment meant that Blipfoto had to pay an annual dividend to its CRP - ie Polaroid - shareholder. In addition Polaroid got the right to brand Blipfoto as Polaroid Blipfoto. However, that payment had presumably not come due as the tie-up was only announced two months before the compulsory liquidation. It seems remarkable given both the new director and staff appointments and the tie-up (investment injection) with Polaroid that only two months after this latter event the company was forced into Compulsory Liquidation. In the same period total current liabilities rose from £23,000 to £97,000. 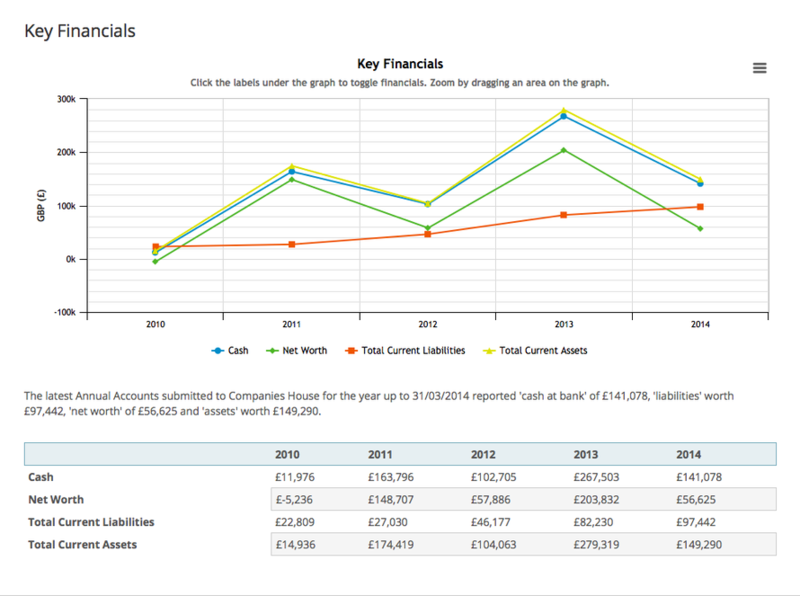 Key Financials data for Blipfoto Ltd from the Companycheck website (click for link). You wonder how the great hype of the '$1bn dollar firm' and 'Scotland's answer to Mark Zuckerberg' (founder of Facebook - see Daily Herald) came to this. Some creditor or creditors must have asked for their debts to be paid off and it pushed the company into liquidation. For me, the most striking and dispiriting feature of these events is the apparent mismatch between the hype about global expansion and the monetary value of Blipfoto and what is seen by many - mainly its users it must be said - as a unique online community of photographers and people. That community at least from my experience is more friendly and supportive than any other social media platform I have experienced and I want to see it continue. The imperative to 'Be Excellent' instilled by Oxford and MIT business-educated Joe Tree really did seem to live amongst the supportive network of users. The users are also in the main fiercely loyal to the Blipfoto founders and team (which was eleven strong at the time of liquidation and has been made redundant). Founder Joe Tree's press comments on the direction of the company were invariably optimistic (see The Drum articles on link above) as new investors and directors came on board. But this must/may have diluted his control of the company both in terms of ownership and strategic direction (Tree and Graham Maclachlan each own 6.08% of the company's shares each) Although Tree and Maclachlan were the third equal biggest shareholders after Scottish Enterprise and PLR IP Holdings (which were probably not voting shares). The issue of how the company was actually going to make a return for its investors as opposed to winning awards and supporting a creative, sharing and supportive community must have focussed the Board's mind. It is unclear if the tie-up with Polaroid was a strategic push in this direction or more an arm's length marriage of convenience by a company that needed funds and a corporation reinventing itself with forays into social media photography platforms. Whatever it was something fairly catastrophic must have happened between January and March 11th 2015 to force the company into liquidation . Update 18th March: Ian Ritchie, the Chair of Polaroid Blipfoto suggested the catastrophic event was a failure for a leap in subscribers to appear after the tie-up with Polaroid which then led to further other funding being cancelled (see The Scotsman 18 March 2015). This seems strange in that the time gap between the Polaroid tie up announcement and liquidation was little over two months. Updates: As at 14.30 on 17th March BBC News reported that the liquidators were talking to 'an interested party' about a possible sale of the website and 'intellectual property'. I hope that is not what Blipfoto's community will be reduced to - 'intellectual property'. I'm now in a position to release this statement to the community and provide some assurance that the liquidator — whose details are below — is confident a viable, long-term future for the Blipfoto platform, community and content will be secured in the coming days under new ownership. There is a preferred bidder and final discussions are taking place as I write. Blipfoto’s members are older than the social media norm. They tend to be in their late 30s or early 40s, and it’s not unusual to find people in their 60s, 70s or older. For many, it’s the first time they’ve ever posted content online. Then came this press release at 20 minutes to midnight on 17th March. To me it spells the death knell for Blipfoto. Have a look at Hilco Gobal's Wikipedia entry. On first blush it looks like asset stripping and private equity. Filleting out value and chucking the rest overboard. I could be wrong. I'm probably wrong. But a friendly takeover by a Scottish 'angel investor' this ain't. Beginning of the Hilco Global press release announcing its plan to acquire Blipfoto. Click for link. Update: See this interesting and perceptive blog from Scottish start-up industry insider Ian Stevenson at Salient Point on the fragility of tech start-ups and the tight timeframe to achieve a positive cash flow. Excerpt and resources from the Scottish start-up industry insider blog from Ian Stevenson at Salient Point - click extract for link. Comment to comments. See #9: I refer extensively to the 'much better analysis' at the top of this blog as an update before this comment was made.